Copies of these books can be obtained as a gift by contacting us if they are to be used by individuals for non profit purposes. In this book Genevieve weaves together some of her newest articles exploring the possibility that gift giving is a fundamental interpretative key for the understanding of language and life, a key which has been cancelled by the ideology and practise of patriarchal capitalism. The restoration of gift giving to a central place in our attention, gives us a way to reconceptualize human beings as Homo Donans, not just Homo Sapiens, or worse, Homo Economicus. A collection of essays about the gift economy by feminist scholars and activists. Edited by Genevieve Vaughan. Published in Italy by Athanor. A book documenting the evolution of Feminist International Radio Endeavor. 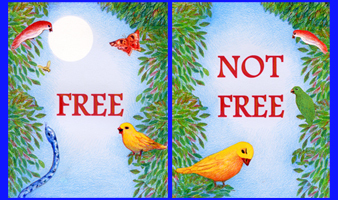 The adventures of Trilly the Canary teach the gift economy to children. Illustrations by Liliana Wilson. A cassette or CD of original music and lyrics by Genevieve Vaughan.